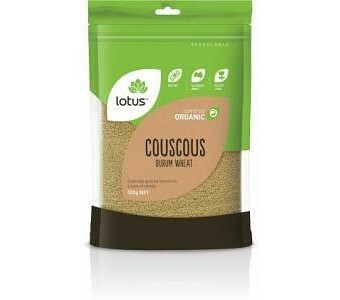 Lotus Organic Cous Cous ( Durum Wheat ) is a coarsely ground semolina, which is a type of wheat. It’s quick and easy to prepare and is rich with essential nutrients and minerals. Originating in North Africa, Cous Cous is very versatile and makes the perfect kitchen staple. It’s ideal for a side dish to an entree and traditionally prepared as part of a meat or vegetable stew. Ingredients: Organic durum wheat semolina, water.